People sometimes leave feedback training confused. Armed with the skills to be candid, they think they have the right to say anything they want. Not the case. Feedback isn’t a weapon or a license to barf your opinion on people. Unsolicited and unwelcome feedback is like fish you left on your counter top for too long. It stinks. You have the right to ask for and accept the feedback you want and reject the feedback you don’t, from peers and customers. Help people know the difference by providing clear parameters on what type of input you do and don’t want. You are not a dumping ground. Giving and receiving feedback tip one: Don’t ask for feedback because you think you’re supposed to. There are lots of leadership books and training programs that tell leaders to be open to and ask for others’ input. Only ask for input you want. If you’ve made a decision or don’t want others’ input, don’t ask for it. While you might get more buy in by asking people for their input on decisions that impact them, you’re allowed to decide without forming a committee. Giving and receiving feedback tip two: When you ask for input, be very specific about the type of input you want. Guide people. Tell them, “I’m specifically looking for input on ____________. I’m not looking for input on ____________.” And if you still receive unwanted feedback, remind people about the input you are and aren’t looking for. In the spirit of being helpful, people can overstep their bounds. 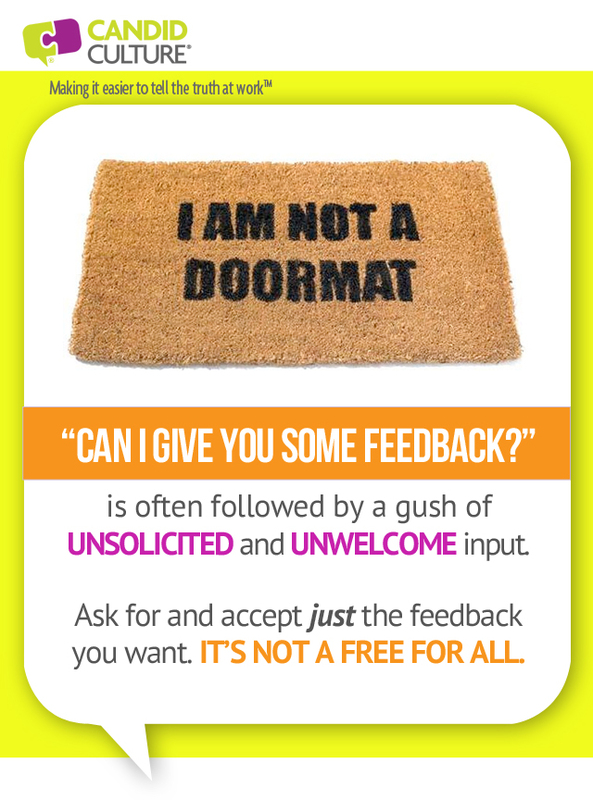 Giving and receiving feedback tip three: Don’t be afraid to shut people down who provide unsolicited feedback. The words, “Thank you for your concern. I’m not looking for input on that at this time” will do the trick. Yes, you really can say that. Giving and receiving feedback tip four: Don’t take feedback personally. While most people don’t think about it in this way, giving feedback subtly tells you that you’re doing something wrong, or at least not how the other person would do it. There are lots of ways to skin a cat. Their way may or may not be better than yours. To “skin a cat” is a terrible expression, by the way. Giving and receiving feedback tip five: Trust yourself. You likely know what you want to do a lot of the time. If you find yourself asking for input when you know what you want to do, stop asking. Listen to your gut and decide. Feedback has a time and a place. I ask for and listen to a lot of feedback, but not all the time and not about everything. If I listened to everything everyone in my life suggested, I wouldn’t own a business or have a baby. Sometimes you know best. Want to know why people get defensive when you give feedback and why they often don’t change their behavior? Because what you’re giving them isn’t actually feedback. Most of what we consider feedback isn’t feedback at all. It’s vague, unhelpful language that leaves people wondering what they need to do more, better, or differently. There are only two reasons to give feedback – to encourage someone to either change or replicate a behavior. Unfortunately, most of the ‘information’ we give is too vague to help people do either. When you give coach or give feedback, you serve as someone’s GPS. Like the GPS on your phone, you need to be so specific the person knows precisely what to change or replicate. If you were driving and your GPS said, “Good job” or “I think you’re off track,” you’d throw the GPS out the window and get a map. If you give someone what you consider feedback and he says, “I don’t know what you mean, can I have an example?” you’ll know you weren’t helpful. Giving feedback tip one: Write down what you plan to say, then strip out half the words. Shorter feedback with fewer words is better. Giving feedback tip two: Practice what you plan to say out loud. Have you noticed that what you ‘practice’ in your head is typically not what comes out of your mouth? Giving feedback tip three: Before having the ‘real’ conversations, give the feedback to an independent, third party and ask her to tell you what she heard. Ensure who you talk with will maintain confidentiality. Your organization doesn’t need more gossip. Giving feedback tip four: Tell someone else about the conversation you need to have, and ask him what he would say. Anyone not emotionally involved in the situation will do a better job than you will. Again, ensure confidentiality. Giving feedback tip five: Ask the feedback recipient what he heard you say. Asking, “Does that make sense?” is an ineffective question. “Do you have any questions?” isn’t any better. Giving feedback tip six: Give one to three examples of what the person did or didn’t do, during the conversation. If you don’t have an example, you’re not ready to provide feedback, and anything you say will evoke defensiveness rather than behavior change. Giving feedback doesn’t have to be so hard. Be so specific that your feedback could be used as driving directions. The purpose of feedback is to be helpful. People get defensive when they receive negative feedback. It’s hard not to. Everyone wants to be seen as competent, and when we receive negative feedback, our competence is called into question, so we react. There are several things you can do to reduce others’ defensiveness – ensure you have trusting relationship and thus have earned the right to give feedback, watch your words, deliver feedback in a private setting, etc. But for today, I’m going to focus on getting a second opinion. If you want people to be more receptive to your feedback, consider encouraging them to get a second, third, or fourth opinion. I’m a fan of casual 360 degree feedback – when we ask for feedback from people we work with both inside and possibly outside the organization. Think of 360 degree feedback like an orange, it’s all the way around, like a sphere. When you get 360 degree feedback, you gather input from all the different types of people you interact with, thus getting a more comprehensive and accurate picture of performance. 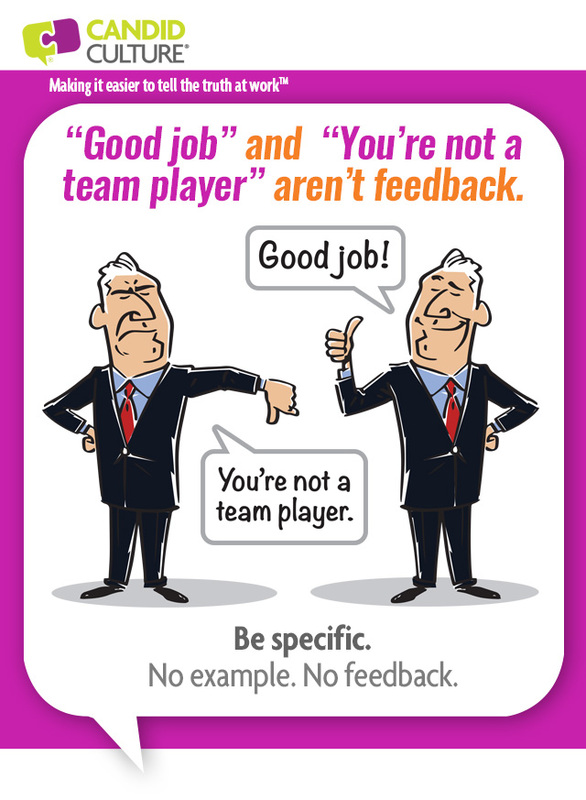 There are different types of 360 degree feedback. 360 degree feedback ranges from the formal – an online, anonymous survey (I’m not a fan) – to casual conversations (which I recommend). In this instance I’m suggesting something I call The Core Team. I suggest everyone has a Core Team of about five people who care about you, know you well, and have your back. Most important is that you trust these people. You Core Team may be personal or professional relationships, or a mixture of both. You may have worked with Core Team members or not. What all Core Team members have in common is that they know you well, want what’s best for you, and will tell you the truth when asked. My core team consists of a friend from high school, two people I used to work with, and my parents. When I get feedback that I’m having a hard time reconciling, I ask people on my Core Team to validate the feedback. It doesn’t matter if they’ve worked with me or not. I am who I am. I do the same annoying stuff in my personal and professional relationships. So a personal Core Team member can provide valid, professional feedback and vice versa. Sometimes they agree with the feedback I’ve been given and sometimes they don’t. But I always get compelling information to think about. And because I trust the people on my Core Team, I listen to what they have to say. Don’t be disheartened if people don’t trust your feedback and aren’t receptive. Instead, see their resistance as human and encourage them to get a second opinion. And then talk again. Listening to and incorporating feedback is a process. It takes time, courage, and patience. Most people would rather get a root canal than participate in an annual employee performance appraisal. Many managers don’t deliver timely and balanced feedback throughout the year. 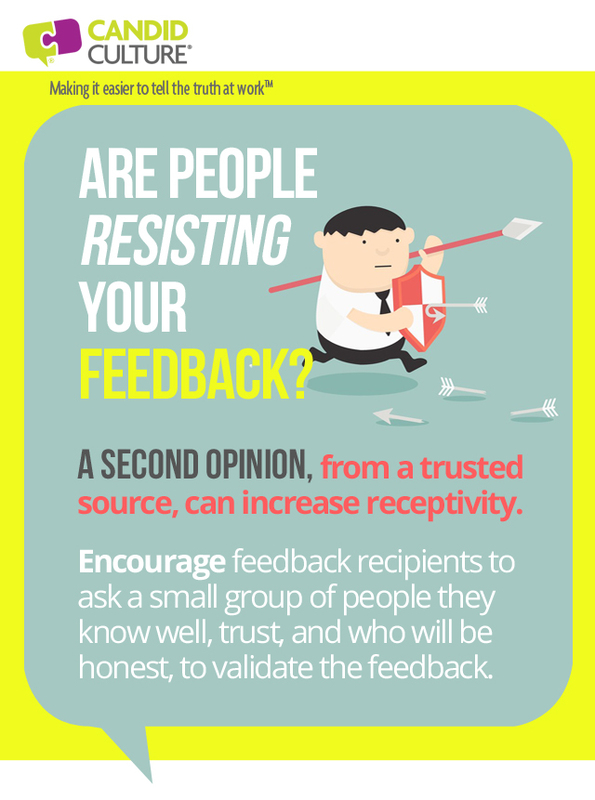 Many employees don’t ask for regular feedback. Too much information is delivered during the annual employee performance appraisal. And as crazy as it sounds, managers and employees haven’t agreed to give and receive regular and candid feedback. Employee performance appraisals don’t have to be the worst day of the year. Managers and employees must agree to give and receive balanced, candid feedback. Don’t assume the agreement to speak honestly is implicit, make it explicit. Managers, be honest and courageous. Don’t rate an employee a five who is really a three. You don’t do anyone any favors. Employees want to know how they’re really doing, no matter how much the feedback may sting. Managers, focus on three things the employee did well and three things to do more of next year. Any more input is overwhelming. Managers, schedule a second conversation a week after the employee performance appraisal, so employees can think about and process what you’ve said and discuss further, if necessary. The key to being able to speak candidly during an employee performance appraisal is as simple as agreeing that you will do so and then being receptive to whatever is said. And don’t make feedback conversations a one-time event. If you do a rigorous workout after not exercising for a long time, you often can’t move the next day. Feedback conversations aren’t any different. They require practice for both the manager and employee to be comfortable. When you feel you’ve been wronged, it’s natural to lay into the offending person, give negative feedback, and tell him exactly what you think. The problem with doing this is that as soon as a person feels accused, he becomes defensive. And when people are put on the defensive and feel threatened, they stop listening. 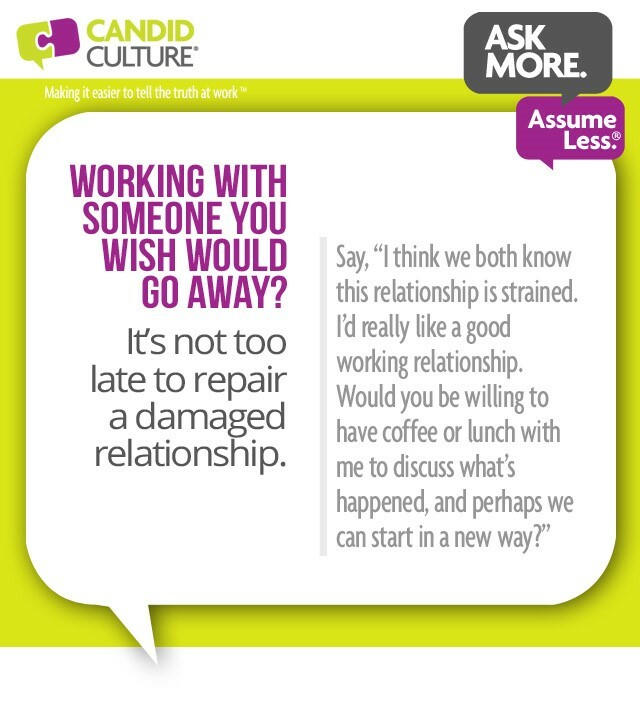 And you’ve potentially damaged your workplace relationship. When someone does something for the first time that violates your expectations, use the lowest level of intervention necessary. Allow the person to save face, and ask for what you want, without giving an abundance of negative feedback and pointing out all the things he’s done wrong. Likewise, when you cut your finger while cooking, you put a Band-Aid on your finger. You don’t cut off the finger. This is true with business communication too. When you’re facilitating a meeting, you can ask the two people who are side talking to stop, or you can go third grade on them and ask, “Is there something you want to share with the rest of us?” Both methods will stop the behavior. But one embarrasses the side talkers a lot, the other only a little. Likewise, when one of your coworkers takes credit for your work, you can give feedback and say, “I noticed you told Mike that you worked on that project, when we both know that you didn’t. Why did you do that?” Or you can skip the accusation and ask a question instead, saying, “I noticed you told Mike you worked on that project. Can I ask why you did that?” From there you can have a discussion, give feedback if you need to, and negotiate. In each of the situations above, you’d be justified in calling the person out and giving negative feedback. And it might feel good in the moment. But being right doesn’t get you closer to what you want, and it can damage your workplace relationships. Practice good business communication –say as little as you have to, to get what you want. If this method doesn’t work, then escalate, communicate more directly, and give feedback. The point is to get what you want, not to make the other person look bad. The better the ‘offender’ feels after the conversation, the more likely you are to get what you want in the future. Sometimes we ask people for feedback when we don’t really want the answer. • Do I look fat in these pants? • Do you think ______ (insert name of person you’re dating) is right for me? • Was I rude to ______ (insert name of person who annoyed you)? • Did I do a good job on ______ (insert project)? Don’t ask questions you don’t want answered. If you do ask, don’t get defensive when you get an answer you don’t like. If you ask for feedback, people may just give it to you. When they do, make it easy on them. So they’re willing to do it again. Don’t get defensive! Every time we get defensive, we train people not to tell us the truth. And it doesn’t take many instances of dealing with our defensiveness before people learn that telling the truth (as they see it) is just too hard. So they stop. And we continue dating the wrong people, while wearing the wrong pants. If you want someone’s opinion, ask for it. And accept whatever they say graciously, regardless of what you actually think. And if you don’t want honest feedback or can’t take it without saying “thank you”, don’t ask. Professional Reputation: Who Talks About You at Work When You’re Not There? Unless you work in a cave, you know that people have a tendency to talk about you, not to you. Often employees have no idea where they stand performance-wise, in their organization, because for the most part, people don’t tell them. This lack of information leaves employees in the dark, not knowing what to do more, better, or differently. People we interact with peripherally, if at all, talk about us to the powers that be in our organizations. And we have no idea. We often don’t know what is said about us, by whom, and to whom. I learned this lesson several years ago, before starting Candid Culture.The most senior woman at the company where I was working, the President of a division, told my boss she’d like to mentor me. Doesn’t that sound nice? The funny thing is, beyond saying hello to me in the hallway, I didn’t even think she knew who I was. We never worked together, and our paths rarely crossed. During our first meeting, the first thing my new mentor said to me was, “I think you’re checked out. So get in or get out. But decide.” Holy _____!!!! I was shocked. She was right, of course. I was already planning to quit and start a business. But I didn’t know that it showed. I’m not telling you this as a lesson about how to manage your professional reputation, even when you may be looking for your next opportunity. Not that that isn’t important. It is. It’s just not my point here. The reason I’m telling you is this: My new mentor was the most senior woman at the company. She reported to the CEO. My boss was her peer. She told me she thought I was checked out. Do we think she kept that observation to herself. It’s doubtful. I’m SURE it came up in a leadership meeting with all of her peers –the C-Suite. If you don’t know who whispers in your boss’s and his/her boss’s ear about you, find out. And the person to ask is your boss. S/he knows and will most likely tell you, if you ask. Who/what departments should I work closely with? Who impacts my reputation and the opportunities I have? Yes, you can ask these questions. No, you won’t die. Yes, your boss will answer them. No s/he won’t be annoyed. I assure you, your boss has had few if any employees who asked him/her these questions. It will be a refreshing change. Just remember, the right answer to feedback is “thank you,” regardless of what you think in your head. The easier it is to give you feedback, the more you’ll get. Read more about how to manage your professional reputation and get more feedback in my new book.